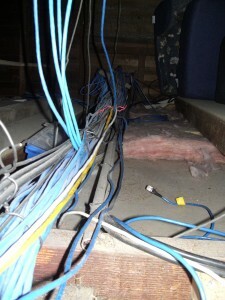 Well, it’s taken a week – but the initial plans (PDF 268K) are now drawn up for the cabling required in the house. The plans are pretty close to the minimum we’ll require to get things up and running again, and only the difficult access areas have received anything over and above what is immediately required. Because the move has been a little more expensive than initially projected, it looks like the cheapest option will be for me to do the installs myself – of course, without the right tools this may present it’s own set of challenges – but, I’ll endeavor to document the process for your amusement. I’ll be crawling around this weekend getting some measurements and then it’s off to the interwebs to see where I can get the bits and pieces I’ll need.